Manjhi is an upcoming film produced by Viacom 18 Motion Pictures, Maya Movies Pvt. Ltd, NFDC. Film is directed by Ketan Mehta. Film stars Nawazuddin Siddiqui, Radhika Apte. You can watch film on 21st August in nearby theater. Trailer begins with Nawaz looking at a mountain and challenging to uproot it. 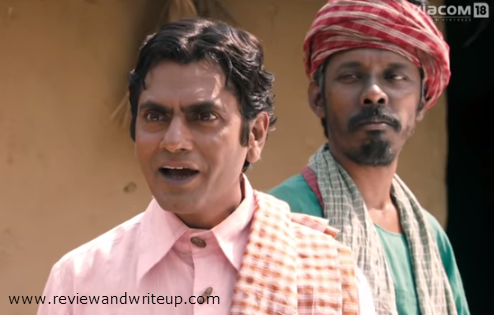 The film is based on a true story of Dashrath Manjhi who was a poor labourer in a village from Bihar. Its a period film based on time around 1950s' and onwards. Its a story of a man who adores his wife (Radhika Apte), who is killed by falling from the mountain when she tries to go to nearby town by crossing it. That mountain has taken many lives similarly. The husband wants to take revenge from mountain by breaking into pieces. Sounds easy, but it wasn't for him. As he was the only one breaking the mountain and face several difficulties, have to survive by eating whatever he can find near mountain. Whether he is able to break that mountain or what other challenges he faces the film revolves around it. Nawaz has always delievered best and I am sure this film is going to win him some awards as well as movie can make money. There are some light romance, comedy scenes in the film which builds more interest. Radhika is looking very hot in the trailer. You are definitely gonna learn something from this film, story. R&W Recommendation - A good film, an inspiring story, strong performances if that's what you look for then this is your film.